The new bridge over the Thames at Walton-on-Thames, the town next to ours, is nearing completion. 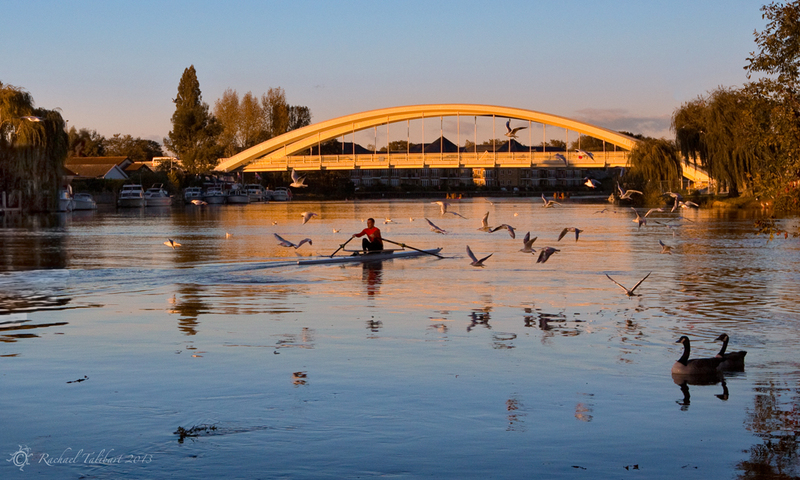 Here it catches the last rays of sun behind a rower and resident flock of seagulls. This entry was posted in photography, travel and tagged bridge, landscape photography, photography, rowing, Surrey, Thames, Walton bridge, Walton-on-Thames by Rachael. Bookmark the permalink. That’s fabulous…the golden light, the rower and those two most perfectly placed ducks. Love it! Beautiful. Wonder if you saw Will Self’s little thing about the Thames in a recent Guardian? So pretty. This reminds me of Heidelberg, Germany, where seeing rowers on the Neckar was quite common.